The Universe Said: Take The Pills…. Yes, I've been taking the Lapatinib... and I feel fine. For all of you who have emailed, I should have said I’m taking the Lapatinib again. I only missed that one day I posted about. But I might not be taking them if not for a fortuitous alignment of the universe. Sunday I decided I just could not stomach another pill. I was in pain and sick and had developed the idea that the pills – not the chemo – were poisoning me. Or at least pushing me over the edge. And these are the pills that are supposed to save me down the road. They are the ones that allow the taxatere to go places it could not otherwise go, like my brain, to seek out and kill rogue cells. It’s the trial designed to help prevent a recurrence of my recurrent type of cancer. And yet….my immediate self was paralyzed by the inability to swallow another pill (on the required empty stomach. Ugh) Sunday morning. So Monday morning I awoke with a start at 4 a.m. and started thinking about a webcast I had watched a few weeks earlier by Dr. William Li, a doctor who researches in angiogenesis, the science of starving tumors by denying them a blood supply. Well, that’s not exactly right. Actually in cancer patients tumors develop because for some reason our bodies have developed capillaries to clusters of deformed cell, feeding them until they become full-on tumors. The body is not supposed to do that unless we need blood to heal an injury. Cancer patients have excessive angiogenesis. Conversely, the function doesn’t work in people who have wounds that don’t heal. Dr. Li says there are certain foods that can starve tumors of the blood supply. Coincidentally, they seem to be the same ones I am eating on my alkaline diet. I wanted to refresh my memory about his work and learn a little more. My heart skipped a beat. That’s me, I thought! I’m a part of this. It can make a difference. People are awaiting the results! They think it will work! What the heck am I doing not taking that medicine! 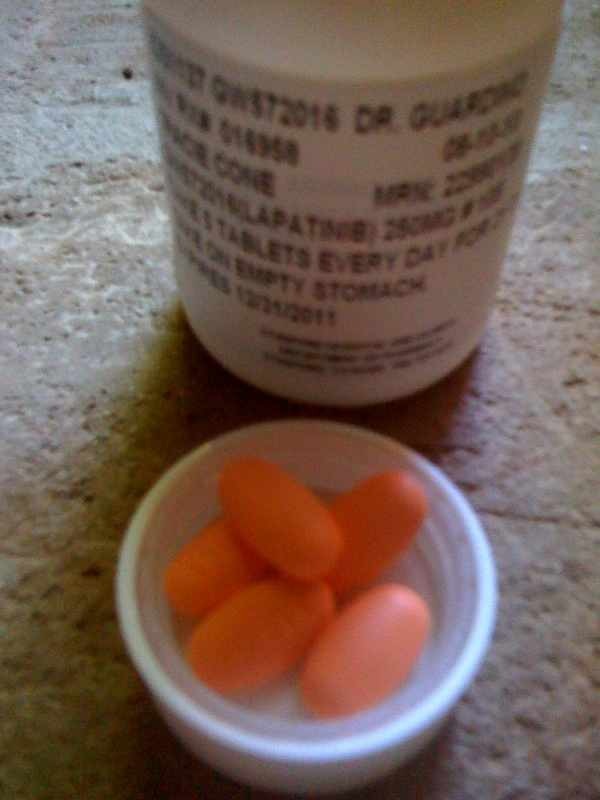 I sat up, fumbled for my pills on the nightstand, counted out five giant red tablets and swallowed them down one by one. I haven’t missed a day since. ANOTHER CHANGE: My dear old friend from high school, Elaine, is on her way back to NC after 10 days of helping through my latest chemo round. Couldn’t have made it without her. She has been replaced by Fran Smith, my dear friend and former editor at the Mercury News, in from New York. Lucky me, again. You are a courageous woman! I am sure it is very hard but keep it up! You are in my prayers. Tracie, Tracie, Tracie. Gotta love you. Tracie as i read your journey i am awed by the courage you have to be real and true and to keep on going. i am lifted in my life by your life. know that each breath, each hour, each day’s sunrise and sunset is a proclamation that YOU ARE LOVED! hang in, hang on. i can’t wait to wear my T-shirt. I have and am praying for you.